Our sales and marketing team have been busy over the last couple of months updating and refreshing the vast majority of our product brochures and instructional literature. With over 12 updated brochures we'd recommend that you head on over to the literature DOWNLOADS section to get yourself copies of the latest updates. And if you need hard copies of the literature posted out to you, or have any questions, then drop us your details using the CONTACT US page. After a very successful 2017, MEDesign would like to say a big thank you to all of our customers and suppliers from around the world for your ongoing loyalty and support. We wish you all a prosperous and successful New Year for 2018. Best wishes from all of us at MEDesign Limited. Great gadgets galore. 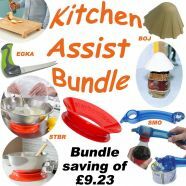 A saver bundle of our most popular and best selling assist products for the kitchen with a stunning saving of £9.23. Includes the superb Staybowlizer (you won't know how you managed without it, Easi-Grip Knife with its beautiful ergonomics, Standard Multi Opener for all those awkward lids, caps and covers and the brilliantly simple Bottle and Jar Opener. Click here to place your order NOW. Limited availability. Only while stocks last...! As we move in to 2017, MEDesign would like to say a big thank you to all of our customers and suppliers, both here in the UK and indeed throughout the world, for your custom and support throughout 2016. We wish you all a successful, peaceful and prosperous New Year for 2017. Best wishes from all of us at MEDesign Limited. Take advantage of the Backfriend SUPER SAVER BUNDLE with a huge saving of £18.80 - choose any Backfriend, add the SUPER SAVER Accessories Bundle which includes a DISCOUNTED Carrycase, complete set of luxurious real wool fleece covers, FREE spares pack and FREE UK delivery. Place your order online now - simple select the Bundle Option when adding any Backfriend to your shopping cart. Or, if you prefer, give our sales office a call on 01704 542373 and place your order over the phone. The revamped edition of the MEDesign Backfriend brochure is now available. It's been fully overhauled and now includes colour swatches of the very latest fabrics (including the very new and very popular Mulberry fabric) that the Backfriend is available in. It's available for download as a PDF from our Downloads Page (click here to visit the page). Or, if you prefer, get a hard copy by contacting our Sales Department (please include your full name and address) or telephone us on 01704 542373. We are delighted to announce that the very latest 2016 edition of the MEDesign Back Pack catalogue is now available. Totally revamped and packed with brand new, exciting products and aids to help make your life a little easier. You can download a copy by clicking here or, if you would prefer a hard copy sent out to you by post, please complete your name and address details on our contact page by clicking here. Available to buy NOW. Be one of the very first people anywhere in the world to own this fresh, dynamic colourway. MEDesign is now live on Twitter. Catch up on all the latest news and daily tweets from the team at MEDesign. And don't forget to keep your eyes peeled for details of any special offers, products of the week and even the odd competition or two! MEDesign would like to wish all our customer and suppliers both here in the UK and overseas a very happy and prosperous New Year. We take security of all customer data VERY, VERY seriously. MEDesign's policies, procedures and technical systems that store, process and/or transmit cardholder data have been independently validated by Trustwave to confirm compliance with the very latest PCI/DSS standards. We are delighted to announce the launch of the new MEDesign website. The fresh new image is coordinated with the very latest responsive design website techniques which permit the information displayed and shopping experience to automatically and seamlessly adapt to the customer's viewing platform such as desktop computer, tablet pc or smart phone. Improved functionality includes a new customer account creation and login facility, overhauled store search facility and streamlined category and product pages for easier site navigation. With the arrival of National Sleep Awareness Week what better excuse do you need to invest in some new, supportive and oh-so comfortable additions to your bed? MEDesign would like to wish all of our customers and suppliers, both at home and overseas, a very happy New Year. It goes with saying that the UK's Emergency Services do a fantastic job providing assistance and support in times of crisis. But did you know that MEDesign's products can often be found in daily use by crews on ambulances and fire engines? Did you spot which of MEDesign's products was in use? It was in fact the MEDesign Patient Handling Sling. Rest assured that MEDesign takes security very seriously indeed. Unlike cheaper SSL certification offerings seen elsewhere on the internet, the GeoTrust True BusinessID with EV (Extended Validation) is a premium enterprise-class SSL security product, visually confirming the highest level of authentication available among SSL certificates with 256 bit SSL encryption and 2048 bit root encryption. Before this type of SSL certificate can be issued the strictest set of organisation and domain authentication standards of any SSL certificate must be successfully completed - we are delighted to announce that MEDesign passed with flying colours. In addition the GeoTrust dynamic True Site Seal Trustmark, with embedded organisation name/date/time stamp provides independent third party verification and validation of the website identity. Yes, that's right. MEDesign is officially 30 years old this month. We've been designing, manufacturing, selling and exporting our products from our factory and offices here in Southport since 1982. And even though you could accuse us of being biased we feel that's something to be justifiably proud about - particularly in view of the current economic climate. But we couldn't have done it without you - our loyal customers. Thanks to each and every one of you for all your support over the years. Here's to the next 30! We've extended and improved our range of Natural Wheat Bags for 2012. Now available with soft, luxurious, polar fleece outer fabric covers and also with the added benefit of French lavender mixed in to the grain to produce a soothing and comforting aroma. 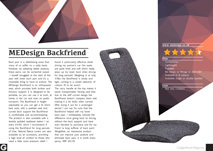 The latest edition of the MEDesign Backfriend brochure is now available. It's available for download as a PDF from our Downloads Page (click here to visit the page). Or, if you prefer, get a hard copy by contacting our Sales Department (please include your full name and address) or telephone us on 01704 542373. 13 exciting new products have been added to our range for 2010. Bought one of our products? Want to tell the world what you think about it? You can now add your own product review using the "Click to review this product" link on any of the product pages. More than 25 new products have been added to our range for 2009. A new improved specification for 2009 but with a SIGNIFICANT price reduction. Our updated range of slide sheets offer excellent value for money. Click here for the details. New VAT savings now apply to online orders. The savings are calculated automatically at the checkout. The latest edition of the MEDesign Back Pack catalogue is now available. Or if you prefer get a hard copy by contacting our Sales Department please include your full name and address) or telephone us on 01704 542373. Our website product information and online ordering facility has been totally revamped. New features include a full product search facility, the ability to E-Mail your friends and colleagues with details of products you think might interest them and also our new point and click shopping cart facility is now fully operational. The days of losing Backfriend screws are over! Our new Hingelock is now part of every new Backfriend. It's simpler, more reliable and (we think) better looking. For full instructions visits our downloads page by clicking here. And prices for all spares or replacements are available in our online store. The BackCare awareness week runs from 11th to the 17th October and aims to highlight the importance of back care. MEDesign is supporting the campaign with literature stands and product placements at various locations. Further details can be found at the BackCare website. The latest edition of the MEDesign Back Pack Catalogue is now available with revised layouts and an extended range of products. You can request your own copy by contacting our Sales Department - please include your full name and address. We've converted even more of our product literature into downloadable PDF format. Check out the Downloads section. We've converted more of our product literature into downloadable PDF format. Check out the Downloads section. A few products have increased slightly in price. That said, we have also achieved substantial reductions on certain product lines. Check out our Product Pages for full details. MEDesign becomes a corporate sponsor of BackCare. BackCare (formerly known as the National Back Pain Association) is a UK charity which helps people manage and prevent back pain by providing advice, promoting self help, encouraging debate and funding scientific research into better back care. The Good Web Guide gives the MEDesign Backfriend a "Best Health Buy" award. Click here for full details. We've converted some of our product literature brochures into Adobe PDF format (and we're working on the others). This means that you can download and printout exact copies of literature that we would normally have to send by letter post. See the Downloads Section. Travelling in comfort is now even more affordable. Our new model inflatable Neck Pillow relieves neck pains at a ridiculously low cost. See the Car/Driving section for full details. MEDesign were invited to appear on one of the major TV health and lifestyle programmes. So Neil Walkingshaw (our General Manager) duly demonstrated our range of products (to very favourable acclaim). The Backfriend and Bedglasses were particularly well received. 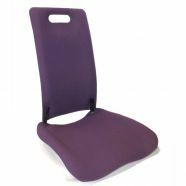 Garden Kneeler Seat - We thought the Kneeler Seat was a bit too expensive so we've found a better model at a lower cost. Click here for full details. MEDesign's own Bed Rope Ladder goes into full production. Whilst similar to existing products, the cost price to the end user is significantly cheaper. Please click here for full details. 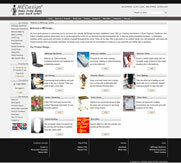 The MEDesign website showing our full product range is launched on the worldwide web. The revamped MEDesign Patient Hand Block is launched to widespread acclaim. The new injection moulded design offers an ultra lightweight product with improved strength properties. Click here for full details.